Endometrial ablation is an outpatient medical procedure that is used to remove (ablate) or destroy the endometrial lining of the uterus in women who have heavy menstrual bleeding. Endometrial ablation should never be performed on women who wish to have children. Endometrial ablation is most often employed in women who suffer from excessive menstrual bleeding, who have failed medical therapy and do not wish to undergo a hysterectomy. Heavy menstrual bleeding is most commonly due to dysfunctional uterine bleeding or adenomyosis. The procedure is almost always performed as an outpatient treatment, either at the hospital, ambulatory surgery center, or physician office. The Endometrial Ablation procedure is primarily performed while patients are under local and/or light sedative anesthesia, or if necessary, general or spinal anesthesia. Patients normally leave the treatment facility within one hour following the procedure and generally spend one day resting at home, before returning to the activities of daily living. After the procedure, the endometrium heals by scarring over, thus reducing or eliminating future uterine bleeding. The patient's hormonal functions will remain unaffected because the ovaries are left intact. Placenta accreta may occur if the patient becomes pregnant after endometrial ablation, so birth control is necessary. Depending on the treatment that is chosen, endometrial ablation is sometimes conducted after treatment with hormones, such as norethisterone or Lupron to reduce the thickness of the endometrium. Women who wish to become pregnant should not undergo endometrial ablation; pregnancy is rare (less than 2 percent) and can have mortal risks for the mother and child. The U.S. Food and Drug Administration (FDA) approves and audits clinical studies to test and evaluate the effectiveness of all endometrial ablation treatments. Two patient effectiveness outcomes are measured at one year following treatment: 1.) Success Rate = the % of women who have their bleeding reduced to a normal period level or less, and 2.) Amenorrhea Rate = the % of women that have their bleeding completely eliminated. According to the results of the Randomized Controlled Trials performed for the FDA approval of the different treatment options, effectiveness Success Rates range from a high of 93% to a low of 67%, and the Amenorrhea Rates range from a high of 72% to a low of 22%. The NovaSure – Endometrial Ablation System (Hologic), FDA approved in 2001, utilizes a metallized mesh electrode array that is introduced into the uterine cavity, applying bipolar electrical energy that creates heat to ablate (destroy) the endometrium. The Novasure average procedure time is 5 minutes from device insertion to removal and is usually performed under local and/or conscious sedation anesthesia. Most patients leave the treatment center within one hour of treatment. In the Novasure Randomized Controlled Trial for FDA approval, the Success Rate was 78% (bleeding reduced to a normal or less level) and Amenorrhea Rate was 36% (bleeding completely eliminated). In addition, 92% of the Novasure patients were Satisfied. The Minerva – Endometrial Ablation System (Minerva Surgical), FDA approved in July 2015, is the first new FDA-approved surgical treatment for heavy menstrual bleeding in over 15 years. Minerva works by generating heat from plasma energy that is created and contained inside a leak-proof ablation array that takes the shape of the uterine cavity. The hot membrane surface of the array ablates (destroys) the endometrium. The Minerva procedure is the fastest FDA approved treatment, average procedure time is 3.1 minutes from device insertion to removal, and is usually performed under local and/or conscious sedation anesthesia. Most patients leave the treatment center within one hour of treatment. In the Minerva Randomized Controlled Trial for FDA approval, the Success Rate was 93% (bleeding reduced to a normal or less level) and Amenorrhea Rate was 72% (bleeding completely eliminated). In addition, 95% of the Minerva patients, "Would recommend Minerva to a family member or friend") and 92% of the patients were Satisfied. The Genesys HTA – Hydro-Thermal Ablation System (Boston Scientific), FDA approved in 2001, uses a hysteroscope device which is inserted into the uterus through the cervical canal, to help doctors safely confirm proper probe placement and to see the area they are treating. In this procedure, the doctor looks at the inside of the uterus with the hysteroscope and then fills the uterus with saline fluid. The fluid is then slowly heated and the lining of the uterus is burned so that menstrual bleeding periods become less heavy and, in some cases, even stops. The fluid is then cooled and removed by special tubing to protect the external areas of the body from any burns. The average procedure time is 26 minutes. In the HTA Randomized Controlled Trial for FDA approval, the Success Rate was 68% (normal or less bleeding) and Amenorrhea Rate was 35% (bleeding completely eliminated). 94% of the HTA patients were Satisfied. The Her Option – Endometrial Ablation System (Cooper Surgical), FDA approved in 2001, is a treatment that creates sub-zero temperatures to freeze and ablate the endometrium. Following the application of local anesthetic around the cervix, a physician uses ultrasound to guide the placement of a cryoprobe to the right uterine horn (cornua). The cryoprobe is activated, reducing its temperature to minus 60°C. The cryoprobe is kept in place while ice is formed in the uterine cavity, under ultrasound observation. Once the appropriate time has passed and/or the appropriate depth of ice has been achieved, the cryoprobe is warmed to 37°C. The cryoprobe is then repositioned to the untreated left uterine horn and the procedure is repeated. Finally, the cryoprobe is warmed and removed. In the Her Option Randomized Controlled Trial for FDA approval, the Success Rate was 67% (bleeding reduced to a normal or less level) and Amenorrhea Rate was 22% (bleeding completely eliminated). In addition, 86% of the Her Option patients were Satisfied. 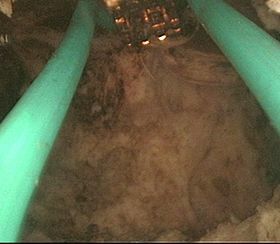 Transcervical Resection of the Endometrium (TCRE) or Loop Resection with Rollerball Ablation as it is commonly called, utilizes a hysteroscope, through which a bi-polar radio frequency electrocautery cutting loop is deployed to resect (remove) the superficial endometrium, followed by a bi-polar radio frequency rollerball tool to ablate the remaining underlying endometrium via cauterization. It is a proven procedure, being a day-care procedure with rapid recovery. The 'Thermachoice III '- balloon (Johnson and Johnson), FDA approved in 1997, was taken off the market in December 2015. This system utilized a heated saline filled balloon which was inserted into the uterine cavity to ablate the endometrium. The fluid was safely contained in a flexible and non-allergenic Silastic membrane that conformed to most uterine cavity shapes and sizes. Older methods utilize hysteroscopy to insert instruments into the uterus to destroy the lining under visualization using a laser, or microwave probe. ^ "FDA letter to Endometrial Ablation Industry" (PDF). ^ "HTA Ablation". Centre for Women's Health – Wichita. Retrieved 15 September 2014. ^ Cooper, K. G.; Bain, C.; Parkin, D. E. (1999). "Comparison of microwave endometrial ablation and transcervical resection of the endometrium for treatment of heavy menstrual loss: A randomised trial". The Lancet. 354 (9193): 1859–1863. doi:10.1016/S0140-6736(99)04101-X. PMID 10584722. ^ Page 122 in Desai (January 2002). Gynecology Endoscopic Surgery: Current Concepts. Jaypee Brothers Publishers. ISBN 978-81-7179-937-4. This page was last edited on 8 July 2018, at 20:31 (UTC).